> Research Library > VMware/Intel Server Refresh and Cost Savings > Why Isn't Server Virtualization Saving Us More? 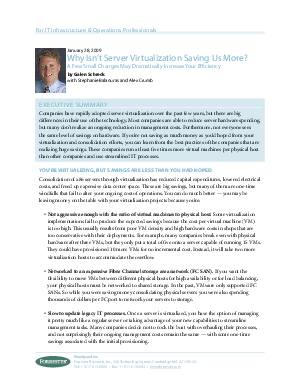 Companies have rapidly adopted server virtualization over the past few years, but there are big differences in their use of the technology. Most companies are able to reduce server hardware spending, but many don't realize an ongoing reduction in management costs. Furthermore, not everyone sees the same level of savings on hardware. If you're not saving as much money as you'd hoped from your virtualization and consolidation efforts, you can learn from the best practices of the companies there are realizing huge savings. These companies run at least five times more virtual machines per physical host than other companies and use streamlined IT processes.